Adrian Henry Hack was born in 1891, the third and youngest son of Sydney, a retired Civil Engineer, and his wife Ellen. The family took an active part in Holmwood life. Sydney Hack had already retired as a civil engineer by the age of 31. He entertained the local hunt and contributed towards local fire brigade fund. Adrian was educated at the Pilgrim School Sevenoaks and then from 1904 to 1909 at Bradfield College, Berkshire. At the time of the 1911 he was training to be a surveyor. The 8th Battalion of the Kings Own Yorkshire Regiment was formed in Pontefract in September 1914. It was part of the 70th Infantry Brigade, 23rd Division. The obituary from Bradfield College states that Adrian Hack was a bombing officer. That means he would go forward of the British lines sending a small patrol 4 – 6 men at night and attack the German with hand grenades. The aim to capture a prisoner for information and harass the Germans. 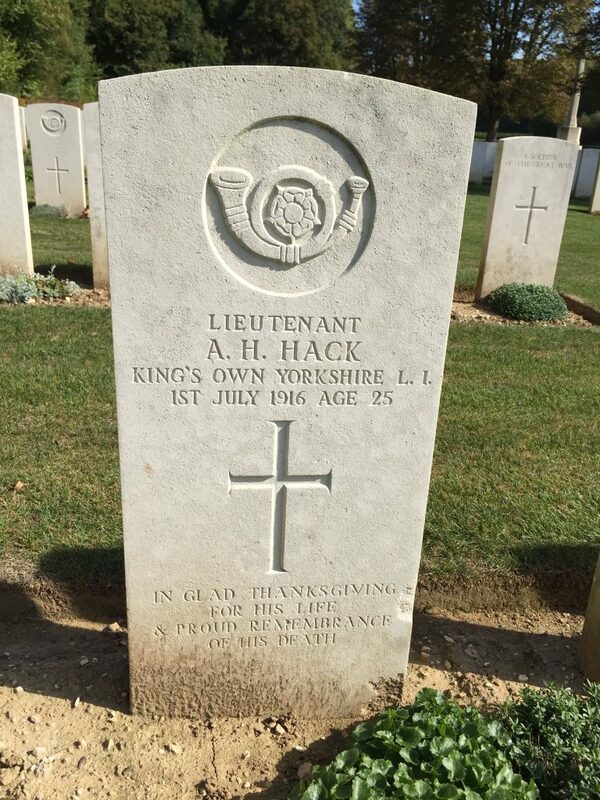 Adrian Hack was killed in action, aged 25, of the first day of the Battle of the Somme. 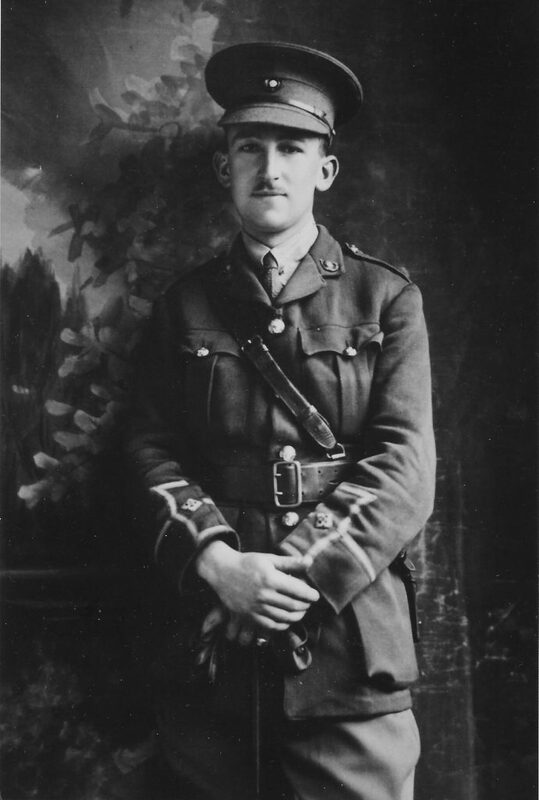 James Melville Babington was the 23rd Division Commander. The Battalion started the assault with 25 officers, the medical officer and 259 soldiers and that after they were relieved, only the medical officer and 110 soldiers reported back. Therefore the missing were either killed or wounded. This report was signed by a Captain who took over command of what was left of the Battalion. He is buried at the Blighty Valley Cemetery, Authuille, The Cemetery was begun early in July 1916, at the beginning of the Battle of the Somme, and used until the following November. At the Armistice it contained 212 graves but was then greatly enlarged when 784 graves were brought in from the battlefields and small cemeteries to the east. Most of these concentrated graves were of men who died on 1st July 1916. He is also commemorated on the South Holmwood memorial. 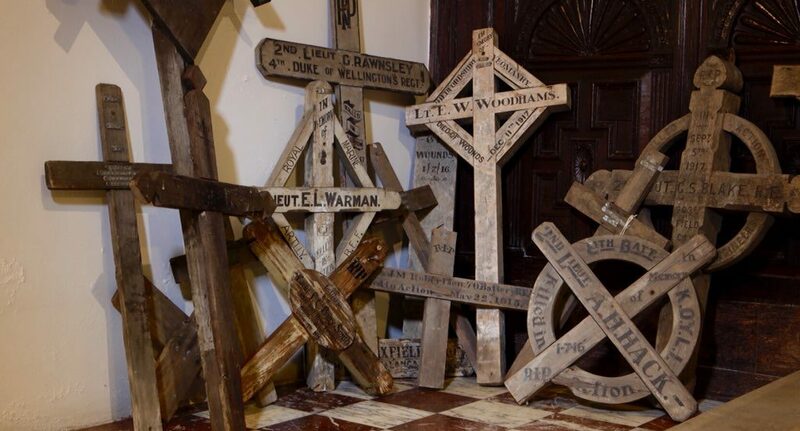 Thank you to Ian Whitlock for this picture of Adrian Hack’s original grave marker in a collection of them at his old school. Bottom right of picture. Regiment 8th Battalion, Kings Own Yorkshire Light Infantry.